Südtirol. Are we in Switzerland? Austria? Italy? 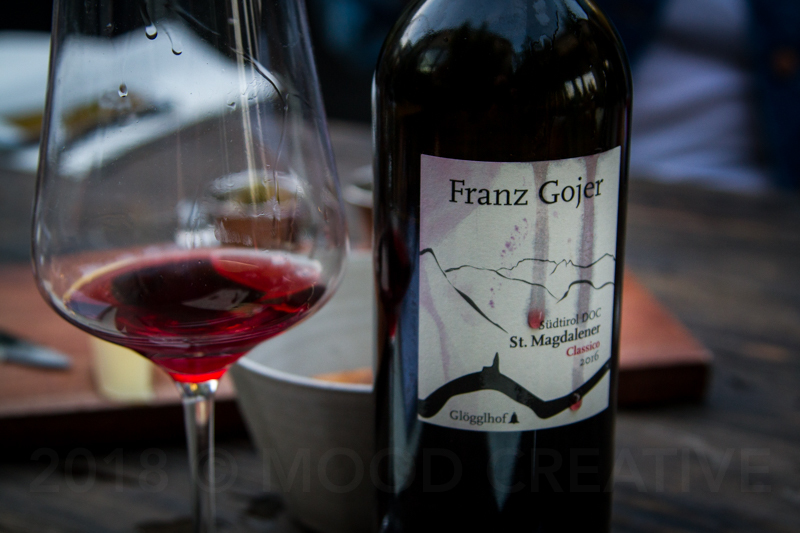 St. Magdalener's rising rockstar winemaker's name is Franz Gojer. That sounds German! Here's a clue: the region's Italian name is Alto Adige. If suddenly transported to Alto Adige, you might not believe you were standing in Italy, because you’d find yourself surrounded by snow-encrusted peaks and folks speaking German. You wouldn’t be entirely wrong to assume you were in Austria; South Tyrol (Südtirol in German) was part of the Austro-Hungarian Empire until the Treaty of Versailles in 1919, when the victorious Allies severed it and gifted it to the Italians. Today it’s an autonomous region in which fewer than a quarter of its residents are native Italian speakers. So it’s not surprising that the wines of Alto Adige DOC (denominazione di origine controllata) bear greater resemblance to the wines of France, Austria and Germany than to the rest of Italy. Besides indigenous Gewürztraminer, the region also produces Schiava, Pinot Noir (both reds); Müller Thurgau, Pinot Grigio, and Chardonnay (whites); as well as many others. More and more sparkling wine is being produced here. The south-draining Adige River valley is more Mediterranean in character than its continental wine-growing neighbors to the north, making it absolutely ideal for wine. Quality in Alto Adige continues to skyrocket after a century of serious setbacks including phylloxera and the two World Wars. Schiava is the Italian name for the grape (and the Italian word for "slave"), just as Alto Adige is the Italian name for the DOCG. The Germans call the region Südtirol, and they call the grape Vernatsch. If grown in Germany it's called Trollinger. According to Jancis Robinson, this grape is in decline. She doesn't seem to mind; she calls it "undistinguished." Franz Gojer would disagree. His gorgeous Gögglhof winery nestled among the slopes of the Alps continues to produce Vernatsch, and it's not unusual for a winemaker of this stature to show pride in a local grape. His Vernatsch hangs from mature vines at 300m, is farmed sustainably, hand-picked, and after time in stainless steel, moves to Slavonian (Croatian) cask where it undergoes malolactic fermentation. The casks minimize the impact of the oak on the wine's flavor. What you're tasting is a pretty pure expression of Vernatsch. The palate shines with cherries and violets. At Hayden in Culver City, we met with Palm Springs Wine Mayor Christine Soto, the owner of Dead or Alive wine bar. (Patrick is the Wine Queen.) Royalty needs a road trip once in a while! What a treat geeking out on the wine in such a gorgeous space. Anyway, it'll be fun drinking Vernatsch (Schiava?) with the Moodies Thursday in Palm Springs at our first Dead or Alive wine social!